Leaving Beyneu I was both sad and happy to see the back of it; sad because it had at least had warmth, clean toilets and electricity and happy because it didn’t have much else to recommend it apart from the three things I just mentioned. I was also quite nervous about my knee failing again and was already pretty much fed up with the cold, which I knew was going to be a standard feature of the next 470km to Kungrad, the next town of any size. It was thus back into the desert I went, once again with trepidation as the weather forecast suggested it was going to get colder and that there would be snow at some point in the near future again. 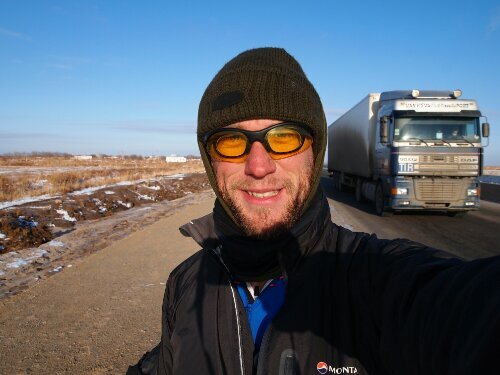 The first day in the desert I had planned on getting to the Kazakh/Uzbek border and waiting for the next day to cross when my visa would be valid. 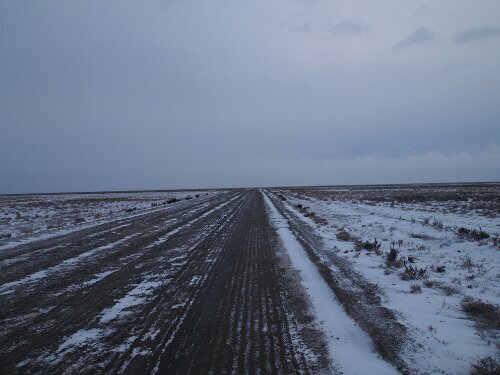 In the end as the road was so bad and the winds again against me, I settled for making it to Aqiligit, the nearest town to the border on the Kazakh side and a town so immense that it is not even shown on googlemaps. The wind got so cold at one point that it started to freeze the water in the bottles on my frame – luckily it warmed up again in the afternoon. This was the road pretty much the whole 80km to the border – as my average speed was about 10kph I spent quite a lot of time on it. Arriving at the town I asked a man standing by the road if there were any places to sleep there – he suggested that there was – though it sounded like he might be suggesting I sleep in someone’s home…Anyway there was still some light so I felt I had enough time to check and set up camp if things fell through. Rolling through the town I wasn’t convinced there was a hotel there – it was basically a few houses and blocks of flats in the desert connected by slightly flattened bits of mud. Its one service of note was its train station which I gravitated towards. 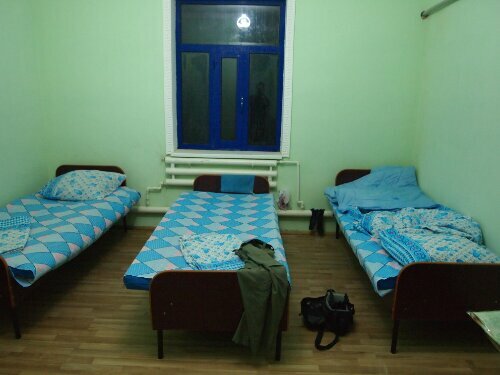 I figured at the least they might have some beds in a sort of dorm at the station itself. When I got to the station some men gestured me in to the station office and then gave me a familiar confused look when I actually did come in. I tried to ask about accommodation and they seemed to suggest that there was some but I wasn’t convinced as most of the conversation was in mutually unintelligible languages and gestures. They were in the middle of a game of what looked to be hearts so it seemed that they would finish this and then help me….I wasn’t sure though and it was cold and getting colder and darker and every moment I waited there camping would get more difficult. A couple of guys weren’t playing cards and I tried to clarify with them that someone was going to show me somewhere to stay. Eventually my persistence paid off (or they finished the game) and they broke off the cards and a couple of the guys started gesturing me to follow them. I had no idea where I was going or what sort of place I would be sleeping in. This didn’t stop me obediently tagging along and we walked a few hundred metres to a small fenced off building which they unlocked; this would be where I would be spending the night. I was relieved! It consisted of two rooms: a kitchen/diner and a two bed dorm room. It had light, warmth and something to cook on and felt about a million miles from camping in the desert. The guys showed me how everything worked – pointed to the toilet (outside of course) and seemed happy to leave me to it. Before they left and before I unpacked I made sure to check whether they were charging me – they were, which was fine as I was ready for it. Once that was sorted and they were gone I made myself at home and cooked some dinner and did some reading. Then I heard a knocking on the door and there was one of the guys checking I was OK. Clearly I looked lonely because he seemed to be suggesting he would come back and sleep in the other of the two beds in the dorm. I tried to indicate that this wasn’t necessary, which was difficult as I wasn’t a hundred percent sure he had said he was coming back in the first place. Once he’d left again I tried to pretend to myself he hadn’t really meant he was coming back. 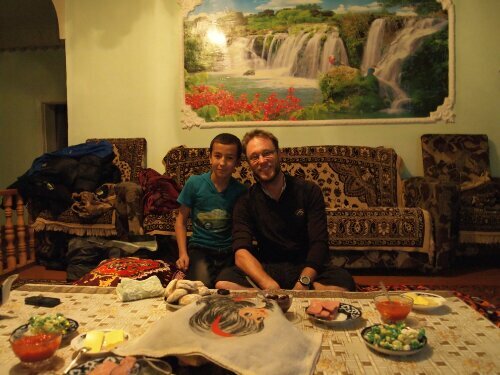 After the previous stay outside a hotel in Kazakhstan at Erbo’s house I knew inside that he would return…And so he did. Which I guess was very nice of him – to make sure that a stranger wasn’t all on his own in a strange country at night. Indeed, I would perhaps have felt a bit more grateful for his consideration if he hadn’t started a watching a film of an adult nature on his phone as soon as he turned the lights out, with the sound on pretty loud as well. As I wasn’t sure what ‘Dude?! Seriously?!? NO! Turn that off!’ was in Kazakh or Russian I put my headphones in turned the music up and hoped either I’d fall asleep or the film would finish soon. 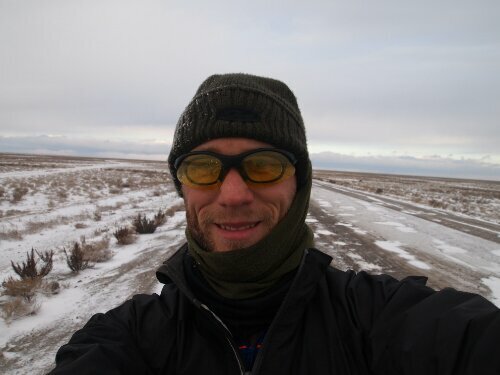 The next morning, I got a good early start, I wanted to get to the border as soon as possible as I wasn’t sure how long it would take and I wanted to get across the Uzbek desert as quickly as possible. There was more but I spent some. 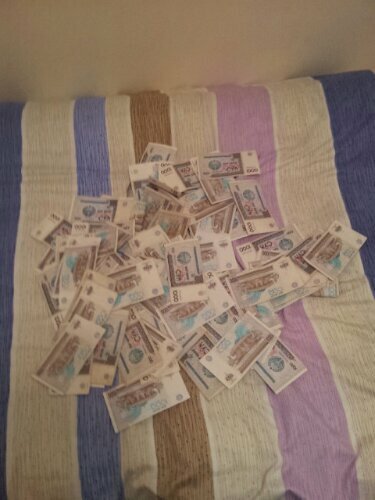 With about half a kilo of extra weight in Uzbek notes I rode off once more into the desert. 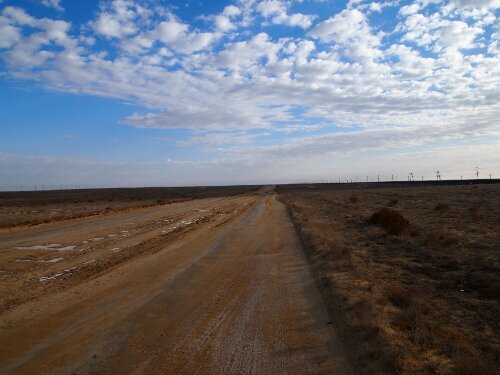 One immediate plus on the Uzbek side was the road. It was tarmac again – not perfect to start with but certainly better than mud and after about 100km it was pretty much uninterrupted smooth tarmac. The wind had died as well so I was able to make a few kilometres after the much longer than expected time at the border. 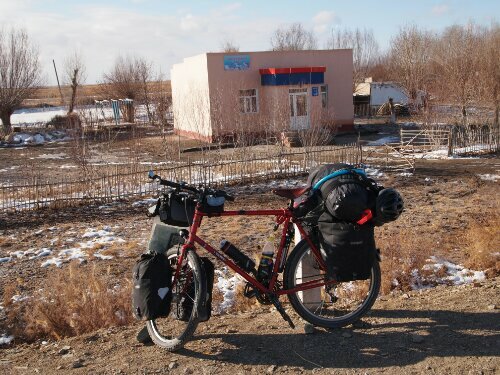 Riding on I decided not to stop at the first Uzbek town after the border: Qaraqalpakhistan – it didn’t look very friendly with wild dogs barking at me from the edge of it. Camping in the desert it was to be then…. 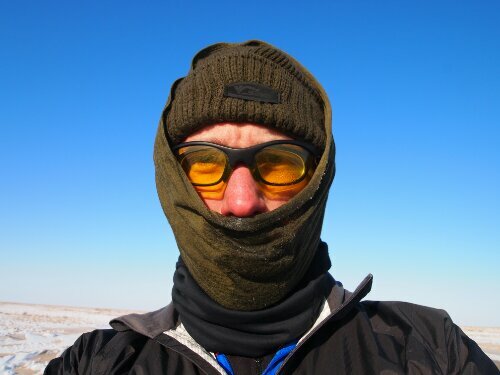 Luckily I was fairly well equipped for it now – with a good down jacket from home, and some Baffin boots rated to -60 degrees and so on. The night was thus not that uncomfortable – I even managed to have hot noodles. In the morning it started snowing just as I was leaving and continued to do so in flurries throughout the day. 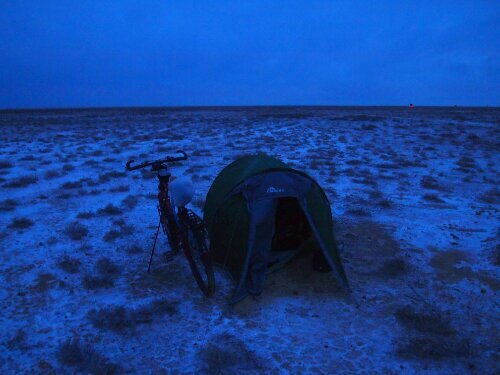 This led to different challenges riding as the day went on and the temperature got colder. As the snow fell and settled a little it was turned to slush by cars driving through it, this slush was gradually working its way under my mudguards and turning to ice as well as spraying up over bits of the bike. This meant I had to stop every so often and knock ice off various bits of my bike and even my boots. Getting it out from under the mudguards was a real pain. I was also having to ride a bit more carefully as I was afraid of slipping, though at this stage the bike still felt fairly stable. It was strange as the whole road wasn’t coated in slush, some parts were and some parts were clean, this was weird as I couldn’t really work out what made the covered parts of the road different from the uncovered – it was all one dull similar stretch of desert road to me. As I got towards the end of the day the slush started to freeze and suddenly I was riding on ice. Luckily it seemed if I kept going forward I was OK and I wasn’t sliding or slipping. Then I reached the town of Jasliq. As it was nearly night and this was the only town marked on my map for the next two or three days riding I thought I’d see if there was somewhere to sleep there or at least get supplies. As I rode in I realised that I had been lucky that day as I’d had actually had a tailwind – this became apparent as I was now riding into it to get to the town off the road. The road into the town was also a lot icier which became apparent as I was suddenly no longer on my bike but sliding along the ground away from it. Luckily no one was around and the wind had kept me going quite slowly so I was pretty much unhurt. In the town I was struck by how much more snow there was as the buildings sheltered it from the desert winds. 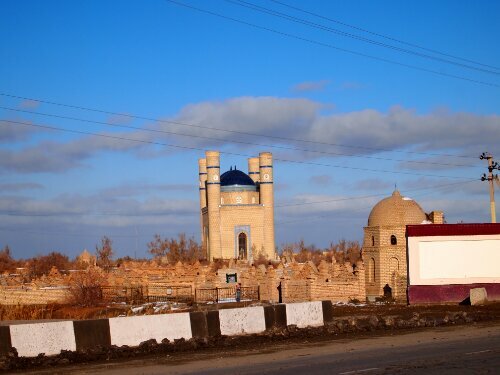 There was also a lot more mud – one of the main features of all the central Asian settlements I had thus far visited. Getting around the town was no fun. I asked a local if there was somewhere to sleep – he gestured further into town. I went in further and asked more locals – they led me to the police. I felt betrayed! Fortunately the policeman was OK and I managed to work out there was no where to stay in Jasliq and that there was a cafe or something about 5km up the road. I wasn’t sure how a cafe was going to help me but I was sure I wanted to get out of that muddy snowy town as I had already fallen flat on my back dismounting from my bike earlier. Getting out of town with the help of some more locals I decided to head down the main road again a bit and see if this cafe that had been mentioned appeared, maybe I could camp there. If worse came to worse there was a lot of room in the desert for my tent. Next thing I see a sign for Camping Ayran (or something similar) with little pictures indicating it had food, beds and showers amongst other amenities! After around 130km of riding since the last town with absolutely nothing that looked in the remotest bit useful and the failure in Jasliq this seemed too good to be true. I refused to get my hopes up, for a start there was no indicator of distance but perhaps this was the cafe which the policeman had been talking about. Riding on I came to it after about a kilometre…It didn’t look very inviting or even open from the outside but then again nothing seems to look very inviting or open from the outside in central Asia. As there were a few trucks parked outside I went to try the door and it opened and I was inside and it was warm and there was a room for me and a hot shower and hot food and it felt like I was in heaven! It wasn’t heaven of course but it was the closest I was going to get to it in that desert unless I froze to death. In the morning I felt even more relieved to have found it when I realised how much colder it had gotten over night. The condensation on the windows in the room I was staying in had frozen and that was in spite of the heating. Realising I was in for a colder day I put a couple of litres of water in the back pockets of my cycle jersey in the hope that my body heat would keep them from freezing. I also stuck a few snickers in there for the same reason on the basis they might be all I would get to eat until the evening when I could heat something up. Starting out I had to ride very carefully as it was really rather icy and I could feel the bike sliding every so often until it went again and I went with it. This crash hurt a bit more than the last as I was going faster, fortunately I only bruised my elbow. The crash did leave me feeling a bit shaken up as I didn’t want to wipe out in front of one of the occasional HGVs that were on the road and I didn’t know how much more of this ice there would be. Thankfully it only went on for another 10kms or so before it started to cover less of the road meaning it was possible to ride most of the time while avoiding it. Unfortunately it wasn’t possible to avoid the increasing cold. I hadn’t ridden in anything like this before – it didn’t take too long for the water on my frame to freeze solid to the point where I couldn’t get anymore out. This didn’t worry me too much though as I had the water in the bottles on my back and a Thermos too, which I felt should be enough to get me to the next town 170km away. My breath was condensing and freezing on my Buff as well but at least the sun was out! The temperature seemed to be continuing to drop and I could feel my body getting cooler even while cycling. I could also feel the bottles on my back getting colder and when I next checked I could feel they were freezing up to. At about this point I started to think a lift would be nice, I’d had quite enough of the desert thanks! I wasn’t too hopeful as the whole time I had been riding from Beyneu no one had offered me one but then to my surprise not long after deciding I wanted a lift two empty minibuses pulled over and the driver of the first one, the boss, gestured me into the one behind! I didn’t need asking twice and I was quite happy sat in there unsure exactly where I was going to be dropped but pretty certain it was going to be out of the desert! And it was, a couple of hours later I was in Kungrad. I didn’t feel as guilty over taking this second lift – I had gotten really fed up of the desert and felt I’d ridden enough of it to know I wouldn’t regret missing another night in it…I also didn’t feel that it was the place to find out if I had suitable equipment for these temperatures. Arriving in Kungrad the boss of the buses tried to establish where I was sleeping and he appeared to suggest there were no hotels and thus offered me a room in the minibus station he was working out of. 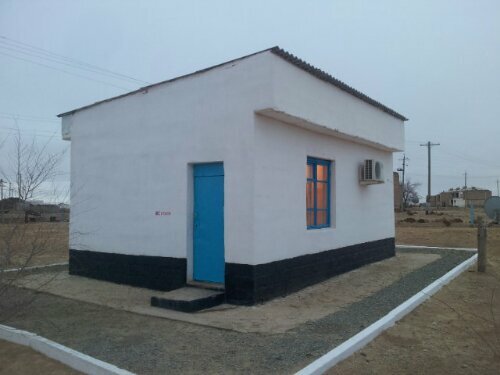 It seemed to be part of a half finished guesthouse and there was a bed in there but I’m not sure if there was heating or electricity. Anyway, having put my stuff up there I got some food from the small restaurant adjoining the minibus station and then went into town. When I came back the lady who I was supposed to return the key to the place I was sleeping in to was waiting for me with her son and after a lot of effort it became clear she was inviting me to come and stay with her family. This was because she thought it would be too cold where I was supposed to be sleeping. Deciding it was probably best not to stand up for the insulating powers of my down sleeping bag I happily accepted. 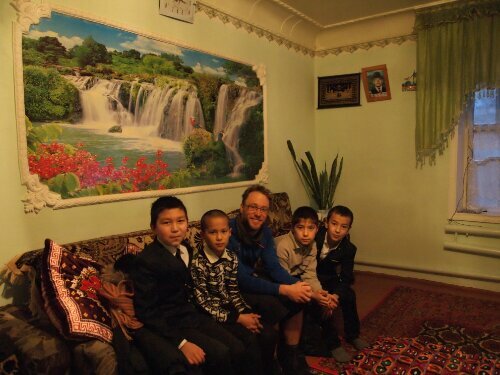 I thus got to spend my first evening with an Uzbek family. This was a really nice experience – it was just the lady: Reyma, her husband Kurchan and their twelve year old son Umichan. They were all really kind and made me feel very welcome, preparing a nice evening tea when I arrived. 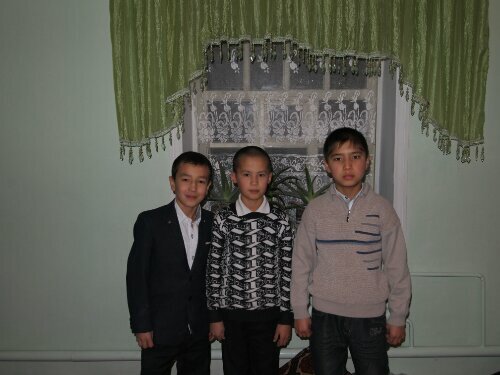 The boy was also very bright and keen to practice the few words he knew in English. Having the child there made everything easier as he was interested in my photos and wanted to play catch with me and so forth which meant there were less uncomfortable silences than there might have been! The next morning everyone was up before seven as the boy had to be ready for school. They gave me a nice breakfast including bread and eggs and more tea – I drank a lot of tea there. Then Umichan went off, I thought for school, but soon he was back and with friends – apparently I was to be shown off. Then it really was school time and of course time for me to leave. Heading off, I felt much happier. I’d managed to get some internet data for my phone so I was better able to plot distances and I thus knew how far the next town was. I also knew that it had proper hotels as it was in the lonely planet. More importantly I was pretty sure I would be able to reach it that day. Leaving Kungrad I was struck by the fact that I really had left the desert. There was more traffic and even people walking or cycling by the side of the road. There were settlements lining the road and even trees! The fact I was excited about seeing trees made me realise how desolate the desert had been. Getting back on a road where there were shops every so often was a massive relief. 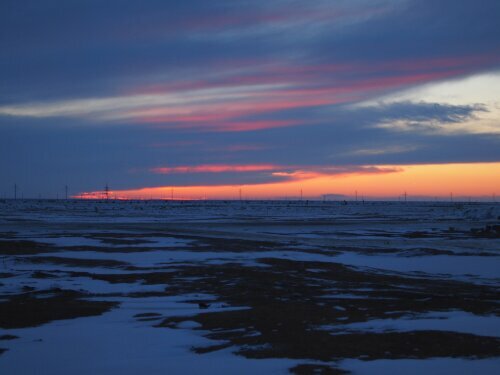 Until I eventually arrived in Nukus, the capital of the autonomous region of Karakalpakstan. Such a great blog! Real adventures, good stories from a far corner of the world and many great pictures. 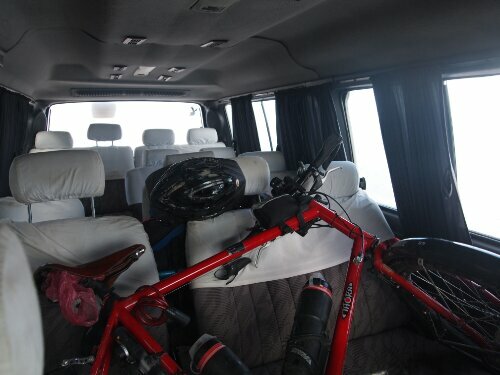 Following your tough desert trip is especially enjoyable on a comfortable couch in a cosy warm flat…. please continue!